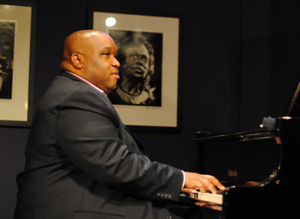 Pianist, arranger and composer Adaron Jackson has performed as a sideman as well as with his own ensembles throughout the U.S. and Europe. "Pops" as he is known locally as well as nationally has performed and worked with such diverse artists as Ron Carter, Conrad Herwig, John Riley, Harry Allen, Frank Morgan, Victor Mendoza, Steve Houghton, Clay Jenkins, Tom Kennedy, Kim Richmond, LaVerne Butler, Red Holliway, Ellis Marsalis, Arturo Sanndoval, Greg Tardy, Slide Hampton, Wallace Roney, and Dave Scott. Adaron has also toured throughout the U. S. with Grammy award winning Motown legend, The Temptations and with I Get A Kick Out Of Cole a Live Onstage Production. The St. Louis Symphony Orchestra has featured Adaron on its Powell On Stage Series concerts as well as through Out-Reach performances. Adaron has performed at the Chicago Jazz Festival, the St. Louis Blues and Heritage Festival, the Smoky Hill River Festival, and the Kansas City Blues and Jazz Festival.